This freebie has a Thanksgiving word wall and two writing pages that can be copied 2-sided for students to write a Thanksgiving-themed story. The word wall is great for them to refer to for spelling and/or ideas. Could be used whole group or in a center. 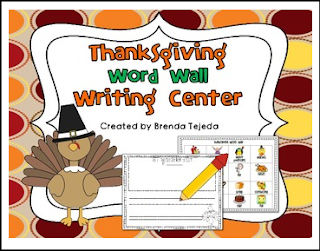 Word wall can be displayed in a transparent sign or stapled to the writing sheet so each child can have their individual word wall.